With half an hour to spare you can make any number of delicious dinner options. In this time you can easily cook most varieties of meat or fish in many different ways and it’s also plenty of time to prepare a number of fantastic rice and pasta dishes. This is a quick and easy dish that is great for informal dinners with friends. It will serve about 4 people. Boil 500g penne pasta in a large pan of water. Meanwhile, fry a chopped onion and 2 chopped garlic cloves in a little olive oil. Add 2 cans of chopped tomatoes; bring to a simmer and cook, stirring often. Cut a large mozzarella ball into thin slices. Preheat the grill to hot and grate a handful of Parmesan cheese. 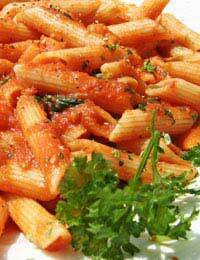 When the pasta is cooked to al dente, drain it well and mix it with the tomato sauce. Put a layer into an ovenproof dish then place a few slices of mozzarella over it and keep repeating this until all the pasta and mozzarella is used. Mix the Parmesan with a handful of breadcrumbs or oats and sprinkle this over the top. Place under the grill for 10 minutes until the cheese has melted. Choose a large, even shaped courgette. Preheat the oven to medium. Slice the courgette in half lengthways and scoop out the seeds with a teaspoon leaving a large hollow along the centre. Break up about one-third of a pack of feta cheese into a small mixing bowl and add a handful of pine nuts and some finely diced red pepper. Season with salt and pepper and mix gently so the feta doesn’t crumble too much. Spoon this mixture into the courgettes, drizzle with a little olive oil and cook in the oven for about 20 minutes, until the courgettes are cooked through. Serve with salad or couscous. Place 2 fish fillets (salmon, cod or haddock are ideal) in a small ovenproof dish and preheat the oven to hot. Sprinkle the fish with some capers, chopped olives, 1 finely chopped tomato, a squeeze of lemon juice and a good drizzle of olive oil. Cover with foil and bake in the oven for 30 minutes. Meanwhile, cook a handful of spaghetti in boiling water. Drain well and toss with some olive oil and 1 very finely chopped red chilli and 1 finely chopped garlic clove. Arrange on plates and top with the fish fillets. These are just a couple of dishes that can be prepared in allotted time. You shouldn’t limit your expectations just because you don’t have hours to cook dinner – good food doesn’t have to take ages to prepare!